CEDAR FALLS - Funeral services for Mildred I. Benson of Cedar Falls, IA will be held at 10:30 a.m. today, Wednesday, February 28, 2007 at the Nazareth Lutheran Church Chapel. Interment will be in Oaklawn Cemetery in Cresco, IA. Friends were to call from 4 to 7 p.m. Tuesday, February 27 at the Richardson Funeral Home in Cedar Falls and also one hour prior to the services at the church. Richardson Funeral Home in Cedar Falls, IA is handling the arrangements. 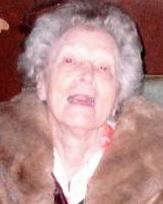 Mildred, 81, died Sunday, February 25, 2007 at Sartori Memorial Hospital in Cedar Falls after a lengthy illness. She was born March 4, 1925, in Ridgeway, IA, the daughter of Theodore and Martha (Aberg) Gunderson. On September 11, 1945, she married Elmer “Benny” Benson in Waterloo. She was employed as a clerk at S.S. Kresge's Dime store and later Woolworths, both in Waterloo and Woolco in Cedar Falls. She and her husband also owned and operated the Travel Tel Motel in Waverly and the Rainbow Motel in Cedar Falls. Mildred is survived by her husband of Cedar Falls; daughter: Patty Fratzke of Reno, NV; son: Ronald Benson of Sherrard, IL; eight grandchildren; and five great-grandchildren. Preceded in death by her son: Michael Benson; seven brothers: Art, Roger, Floyd, Lloyd, Gerald, Oscar and Arlis Gunderson; and three sisters: Marjorie Fischer, Grace Slock, and Inis Gunderson.